The most known Cretan salad is what we call kritikos dakos. It is delicious, it is healthy, it is the ultimate representation of the Mediterranean diet, straight from Crete. 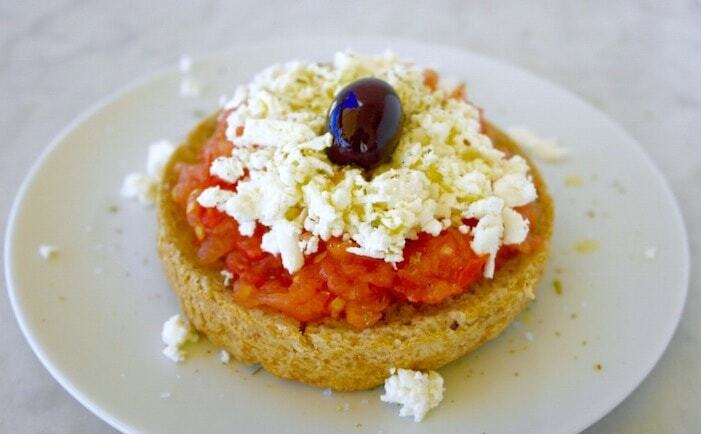 First of all it’s been described as a Greek bruschetta, but it isn’t, it is a bit different. Here’s what it is: Dakos specifically refers to a recipe that uses the famous Cretan barley rusks. These rusks are made with whole grain barley flour, water and salt. They are super hard and super healthy. Also dakos includes olive oil, tomato, and crumbled cheese, traditionally this cheese is Cretan mitzithra but you often see it (outside of Crete) made with feta. And that’s it. Sometimes there may be a few capers scattered around, but really it is just tomato, rusk and olive oil. Nutrition wise, I cannot think of a better dish for anything really…salad, appetizer, meze, main course. First of all let’s talk about the paximadi (rusk), these are traditionally made with barley flour (whole grain), salt and yeast. Barley contains a type of fiber known as soluble fiber that helps lower the bad cholesterol (LDL). But it also contains beta-glucan a component of carbohydrates found only in specific grains such as barley, that appear to also lower cholesterol but also lower blood sugar and provide better control of insulin. Barley has also been found to lower blood pressure and reduce hunger and increase satiety. The tomato and olive oil as you may already know, are excellent sources of antioxidants (and the oregano if you add it). The olive oil also gives all that good fat (and favor) and the cheese is your source of protein and calcium. Yes, this is a complete meal, but also a healthy meal for several reasons: It is a rich source of fiber, it fills you up, it provides antioxidants and vitamins, it contains good carbs, good fats and protein. I will say that if you do not have Cretan rusks to use thick whole grain bread that is toasted. But to be honest, I strongly suggest that you get yourself some Cretan barley rusks. 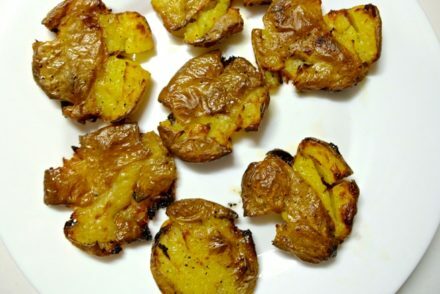 They are so healthy and can be used for the dakos, you can crumble them in salads or just eat them with a bit of olive oil and oregano. And they a have a long shelf life. I did a quick search and even Amazon carries several Greek brands. The recipe is straightforward and only takes a few minutes. Make sure you grate the tomato, I’ve seen recipes with chopped tomato, but grated tomato is how it is usually served. This makes the dish even more enjoyable: you have the top layer with the soft and smooth tomato-cheese mixture and below a crunchy but juicy barley rusk crust. I also load these with a lot of tomato. I actually used almost one medium tomato for each dakos. Grate the tomatoes and drain all the liquids. Pass the rusk under running water (very quickly) and place on a plate. (Skip this step if you using bread). Cretan rusks are very hard but you do not want to soften them too much, you do not want a soggy dakos. It should still be crunchy but easily breakable. Add about 1 tablespoon of olive oil and let it absorb. (Please note that here in Greece we often add much more olive oil, but this amount works fine). Spoon the tomato on top, covering the whole rusk and then add the crumbled cheese. Dakos! So delicious! I love how your post addresses the nutritional benefits and recipe differences between the Cretan and Greek version. Great site with wonderful information and recipes! Thanks! I think it is important that foods tastes good buy can also be good for you. Sounds very delicious:) Hope to find barley rusks in Poland. Thanks Zuzanna! There are online stores that can deliver cretan rusks anywhere in Europe too. Is this also known as κουκουβάγια? I’m enjoying your site so much! I hope I may ask an off topic question: My neighbour, here on Crete, brought me some striped, a bit hairy, vegetables. They look a bit like cucumbers/courgettes. I googled but no result. 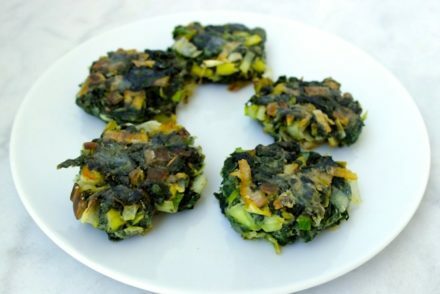 Do you happen to know this mysterious vegetable and how to prepare it? Thank you! Thanks Hanneke! Not sure what that can be. Maybe some sort of wild variety of zucchini. You can try making a lathero with it. The striped, hairy vegetable is the local, delicious cucumber. It is usualy very crunchy and smells heavenly. Wash it well, peel it and eat it just with a bit of salt. Thanks Eni! Would love to have some of those. Thanks a lot Eni,You are right it is delicious and tastier than the regular cucumber! How lucky we are to have such wonderful vegetables on Crete! It’s called ksylaggouro, which literally translated to wooden cucumber. I agree it’s the best thing ever. People in the Maghreb (North Africa) also eat a lot of barley bread, and I can easily find it in Montréal, where there is a large Maghrebi population (whether Muslim or Sephardic Jewish). There is also barley couscous, which is a very nutritious food. Love Dakos! Love Cretan Rusk! But as I am generally gluten-free, they sometimes give me a little tummy trouble the day after…As a nutritionist and a consumer I have to say I LOVE your site, FB page and all the information in it. We recently came back from a 2 week holiday in Kythera (I am half Kytherian) and am still living in the dream of beautiful Greek food and clear waters. We live in Singapore, and not always easy to get both! Do you recommend a good gluten free version of the cretan rusk? Thank you Karen! I love Kythera! We have family there and have been several times. Perhaps the tummy trouble is due to the high fiber if this dish. Unless you have celiac or some other diagnosed allergy, the gluten may not be what causes those symptoms. For a gluten free version, the only thing one would do was use gluten free bread or make their own rusks without the barley flour. However, then it would no longer be a Dakos, nor would it have the health benefits of the barley. I’m just starting to follow a Mediterranean diet and it is perfect timing to find your site. 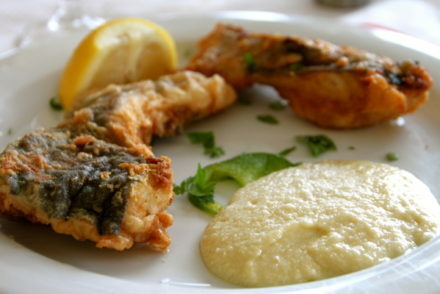 I’m going to serve the Cretan Dakos today to my family. Hope you enjoyed it DeAnna!